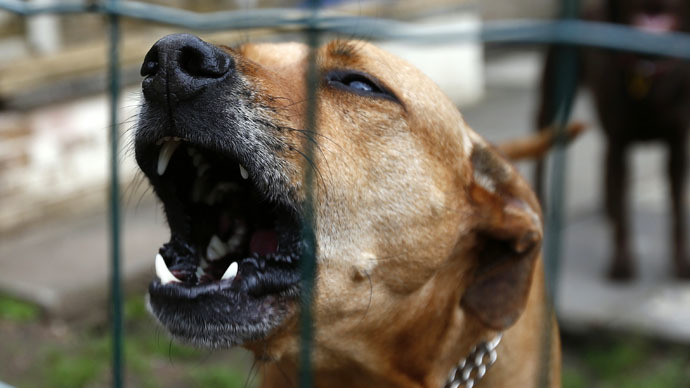 A Croatian court has ordered that a dog named Medo must let sleeping neighbors lie, and has warned his owner he will have to pay some €2,800 ($3,160) if the barking pooch doesn’t keep a lid on it for the night. The injunction was leveled against the 3-year-old mutt in the northern village of Pula, making him the only dog in the country to face a nighttime barking ban, AP reports. Medo will now remain locked up in a barn from 8 pm to 8 am instead of being allowed to go on the prowl. The case was brought by a sleep-deprived neighbor who said the dog’s barking was affecting her health. Medo’s owner, Anton Simunovic, said the accusation was simply not true. "He barks normally, like any dog does," AP cited Simunovic as saying. "He barks when he sees a cat, or if someone unknown comes to his territory." The muzzled mutt has sparked widespread social media interest. A Facebook page dedicated to Medo has already garnered over 43,000 likes. Twitter users have also taken up the cause with a #freemedo campaign. Others, in perhaps a strange decision, have appropriated Je suis Charlie, the slogan adopted by supporters of freedom of speech and freedom of the press after the 7 January Charlie Hebdo massacre, to throw their support behind the dog. #JeSuisMedo has, perhaps predictably, gone viral. A final ruling in the case is still pending, with the neighbor seeking €1,400 in damages. It’s a dog’s life indeed.